When we speak our language it sounds so good. 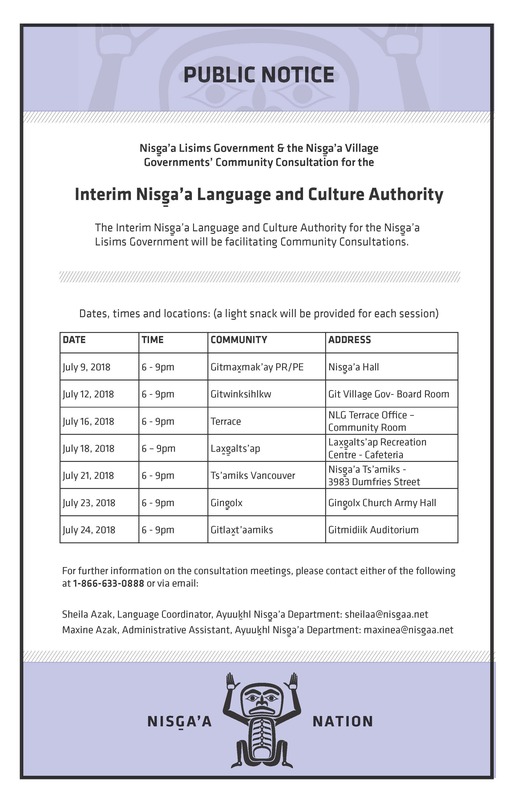 Nisga’a Lisims Government (NLG), Council of Elders and the Interim Nisga’a Language and Culture Authority invites Nisga’a Citizens to complete the Nisga’a Language Assessment Survey. NLG appreciates your participation and engagement in the planning of Nisga’a Nation language revitalization. By clicking on the link below, you will be redirected to a ‘Survey Monkey’ online site that is used to process the Nisga’a Language Assessment Survey. Please complete the survey questions which includes multiple choice questions and questions requiring you to enter feedback as comments. The Special Assembly of the Nisg̱a’a Nation is taking place in the Nisg̱a’a Village of Ging̱olx May 7 - 11, 2018. In honour and support of the many Canadian veterans, Nisga’a Lisims Government participated in the Royal Canadian Legion’s annual Remembrance Day poppy campaign. $317.75 in monetary donations have been collected by NLG and will be donated to the Royal Canada Legion - Terrace branch. The Nisga`a Nation proudly honours and remembers the contributions of all of our beloved Nisga’a veterans on this Remembrance Day. TAKE NOTICE THAT in accordance with the Constitution of the Nisga’a Nation and the Nisga’a Government Act, the Nisga’a Lisims Government (NLG) Executive via NLG Executive Resolution 2015 / 109 has scheduled a Special Assembly of the Nisga’a Nation to take place Monday May 2, 2016 to Thursday May 5, 2016 at the Gitlaxt’aamiks Recreation and Cultural Centre. With the Federal Election scheduled for October 19, 2015, below is the link to the Elections Canada - 'My Voter's Guide' in English and Nisga'a that outlines the requirements for voting. Nisga'a Lisims Government is proud to present our latest production, "Lock, Stock, & Barrel" which features vintage footage of our leaders past and present discussing our history, our ownership of our ancestral lands, and their hopes and vision for our future. In the words of our elders, the time has come to be bold, and take the next step for our collective future! The Nisga'a Nation strives for sustainable prosperity and self-reliance. To achieve this goal, Nisga'a Nation wishes to attract sustainable economic development, including LNG projects, to our area. The package attached is a preliminary description of available LNG sites on the Portland Inlet waterway, near the Nass River, on Canada’s west coast, north of Prince Rupert.